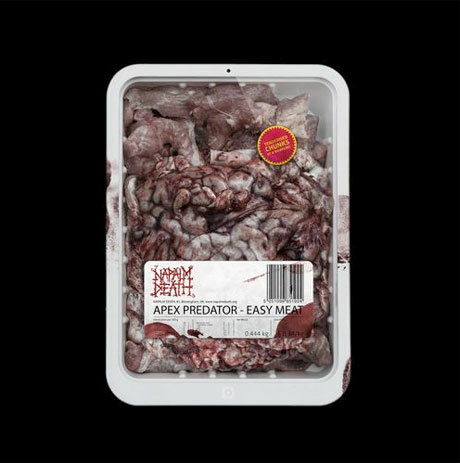 UK grind greats Napalm Death have been doling out info on their upcoming Apex Predator - Easy Meat for the last little while, and the band have finally given us all the remaining pieces. Via a newly revealed tracklist, we now know that the album, which lands in North America on January 27 through Century Media, will feature 14 songs altogether. As previously reported, the album was influenced by last year's Rana Plaza disaster in Bangladesh, with vocalist Barney Greenway examining working conditions and slave labour through song. This would appear to be reflected through song titles like "Dear Slum Landlord..." and "Hierarchies." Earlier in November, the band premiered new tune "Cesspits," which a statement from Greenway now confirms "is both literally and figuratively about people living in holes." He added, "It is perhaps one of the ultimate indignities and one of those things that a blind eye is often turned to. The subject matter called for a very savage delivery, and although there are quite a few musical facets to this song, it doesn't stop letting rip." You'll find the full tracklisting down below, while you can eyeball the raw, meat-packing imagery that serves as the set's album art up above. "There are many meanings that you could grab from the new album artwork, I think," bassist Shane Embury said in a statement. "But one is the representation of how our natural and most basic needs for happiness and communication are being stripped away by materialism and pre-packaged garbage — crap that we don't need, filtered to us through the media via the megacorporations with the goal to maintain the bloated bottom line of profit." Napalm Death start their North American "Through Space and Grind" tour with Voivod on January 27. As previously reported, longtime guitarist Mitch Harris will be sitting out the tour and taking a hiatus from the band due to a family health issue.